Who is Tom Price, MD? 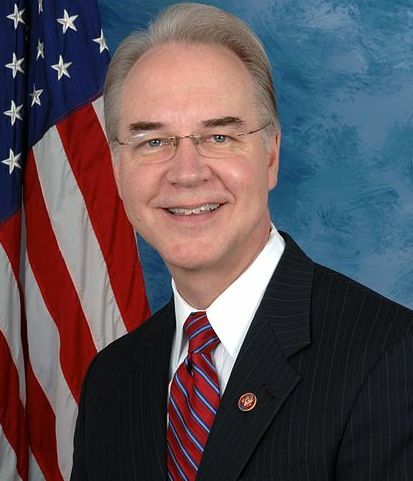 By now you've heard that president-elect Trump is nominating conservative Republican representative Tom Price, MD of Georgia's 6th congressional district as the 23rd Secretary of the US Department of Health and Human Services (HHS). Read on to see why you should care. What’s the HHS got to do with me? The Public Health Service which oversees familiar acronyms such as the CDC, FDA, and the NIH. Not impressed? How about this one? HHS also oversees the Centers for Medicare & Medicaid Services (CMS) which is responsible for health coverage of ~100 million people or roughly 1 in 3 Americans. Dr. Price is a graduate of the University of Michigan Medical School. He completed his orthopedic surgery residency at Emory University in Atlanta and worked in the private sector for 20 years before joining Emory’s faculty in 2002. He also served as the director of the Orthopedic clinic at Grady Memorial Hospital. Dr. Price got his start in politics through the Medical Association of Georgia and was elected to the Georgia state senate in 1996. He functioned as the state senator of Georgia’s 56th senate district until 2004 when he was elected to the US House of Representatives, succeeding Johnny Isakson as representative of Georgia’s 6th congressional district. He has retained that seat since then, most recently winning re-election in 2016 winning 61.6% of the votes. Since his nomination, there has been many editorials written about Dr. Price’s anticipated impact as HHS secretary. Below is a summary of his political stances and why there has been so much controversy surrounding his nomination. Dr. Price is a fierce opponent of the Affordable Care Act (ACA). He is the sponsor of and has introduced the house bill Empowering Patients First Act (EPFA) in every congressional session since 2009-2010. The EPFA is positioned as a replacement for the ACA. Among its many provisions, the EPFA would roll back the federally funded Medicaid expansion in 31 states and Washington, DC. Dr. Price is considered a social conservative. He is an opponent of abortion rights and gay rights. For example, he received a 2016 rating of 0% by Planned Parenthood and 100% by National Right to Life. He also scored 0 on the Congressional Scorecard by the Human Rights Campaign. Dr. Price is a member of the Association of American Physicians and Surgeons (AAPS) which is considered a right-wing organization. The association’s Journal of American Physicians and Surgeons has been criticized for advocating non-scientific views including the now-discredited claim that vaccines cause autism. The American Medical Association (AMA) was quick to endorse Dr. Price’s nomination. However, the endorsement has rapidly generated backlash, including this very public one from Dr. Carolyn Sax. As of this writing, an online protest titled The AMA Does Not Speak for Us received 4,255 physician signatures. In summary, the nomination of Dr. Price to head the HHS is controversial, however not unexpected. Given President-elect Trump’s repeated vows of repealing Obamacare, he could not have found a more vocal champion. It remains to be seen whether any of Dr. Price’s proposals will make its way into the anticipated healthcare reform bill. But whatever the outcome of the final legislation, Dr. Price will have a powerful hand in its implementation and regulation. Questions and comments? Reach out to me at http://futureproofmd.com/.